"Let's turn your yard from 'no!' to 'whoa!'" 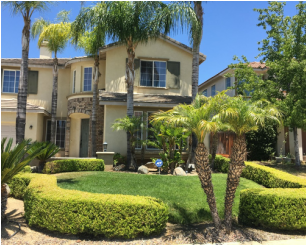 ​landscaping contractors in Folsom, (we prefer to call them designers,) are an essential part of our integrated services, creating custom designs for each project and step by step planning with you so that you are informed every step of the way. After all, this is your project, we just help conceptualize it into fruition. Bring us your ideas, we’re truly excited by the work that we provide day in and day out and are looking forward to going over every detail and aspect that goes into your space. Regardless of the landscaping services you’re inquiring about, whether residential or commercial, small service, landscape designs, tree service and so on, you can be sure we’ll exceed your every expectation with our expert crews, as we take into account every detail with the knowledge behind our years, from your first phone call to the grand finale. Allow us to create the landscape design of your dreams! We here at Folsom Landscaping Pro’s are crafty in many avenues of landscaping including but not limited to, Incredible hardscape’s, lovely softscape's, stunning waterscape’s, bark work, rock work, paving stone , masonry, edging, bushes, mulch, sod installation, flower planting, tree care, tree houses, shrub planting, fences, retaining wall's, arbors, pergola, gazebo's, deck's, patio’s, gardens, fire pit's, drainage, irrigation, custom lighting and more. Just ask and you shall receive! Hardscaping is the term for all of the non natural features that go into the design. Brick work, river rocks to line a pond, stone path's to stroll along, retaining wall's to plant your shrubbery, statue's, and everything in between. Hardscape's create an elegance throughout the space leaving a strong impression of beauty. There are endless ideas and exponential detail that can be put into every inch of these hardscape's. Softscaping is all the pretty, more dainty accents that attribute to the yards greenery and color pop. Shrubbery, plants of all sorts, bushes, beautiful flowers, vegetable gardens, and tree’s to your liking, these add a lovely feel to your secret garden making your space feel like a grand escape. Waterscaping are the pond and fountain designs that create a tranquil space of peace and harmony among your yard. Who doesn't love the calming sound of trickling water? Our aquascapes are carefully constructed to your artistic design for all to enjoy for years to come. Give your yard an instant makeover with sod. Sod is pre-grown grass rolled up and ready to roll out onto display for instant gratification and use. We supply only the best in town and cut to order. Let us build the outside accents of your choice! Perhaps you’ve dreamed of that perfect gazebo or a gondola, designed to your liking to enjoy the summer breeze and shade yourself from the summers heat. Maybe you envision yourself high up in a tree in your very own tree house, (now that’s a grand escape!) Perhaps an accented retaining wall will do or enjoying dinner out by the fire pit. Let's build a patio overlooking your yard! You’re only limited by your imagination. If you can think it, we can build it. There are countless backyard ideas and our professional team of designers can give you their insight and ideas every step of the way if need be. We are your landscape architecture experts! We specialize in an array of garden landscping design styles including, Mediterranean gardens, Japanese Gardens, cottage gardens, Southwest landscapes, formal gardens, edible gardens, (producing great crops with the perfect fertilizer! ), tropical landscape design styles, Tuscan design styles and xeriscaping. The choice is yours, and whatever it is you choose, the outcome will be stunning to all eyes to see. Just know that we are your pro's when it comes to garden designs ideas! I'll tell you what, we've been landscaping Folsom for years and that's why we can call ourselves pro's! Our service and skills are top of the line and we're a friendly, creative bunch too! Our crews are the best of the best and you can see it for yourself in their work ethics. You'll be pleased to have chosen us, (just as we like to choose our customers too!) Don't hesitate, fill out the form and we'll have a phone call back to you as soon as can be! Don't postpone on getting your free quote, we're happy to welcome all new customers and ideas and are looking forward to transforming your yard. Fill out the contact sheet and give us a call at 916-741-5423. Mention this website and we may just add a little something extra! WHICH TYPE OF CLIENT ARE YOU? -Ready to build, with designs on hand and a budget ready for a bid? -Have an idea, need help, not ready to break ground. If you're looking to update your Folsom Landscape or create a whole new oasis, we've got you covered!